One evening a friend and I went to the Pour House in downtown Raleigh to listen to music. The brick alley way entry reminded me of clubs in New York and DC. We were pleasantly surprised to hear the level and quality of music from the first act jazz singer and pianist. Then there was a break. We read about the next act being a country singer. Not knowing what to expect and intrigued at the same time, we awaited our introduction to a new singer, a woman who had a voice, style, talent and unique sound, Rissi Palmer. It was a shock that Rissi was a local. She seemed too polished. This may have been about four years ago. Her claiming country music was unique for an African American woman. In that show we learned that Rissi had begun her career with a top ten chart for a country single and later left the Nashville scene to start a family. At the Pour House we learned shows relaunching her career. Rissi is an instagram sensation. Here is where she successfully weaves her public persona as a musician with her private life. Rissi Palmer’s story is well documented on her website, and online including an interview on an NPR show which was a treat. At five years old under the influence of her mother she was exposed to American singer Patty Kline and R&B Soul. Her passions took her from high school straight into a music career. Her instrument of choice is the guitar which compliments her voice. After that first performance, I have been tracking Rissi with my friend enjoying her unique style of music. Since then she has continued to reinvent herself as a ‘Southern Music Singer’ which continues to include Country. What I could discern from her first hit anyone could be country in the USA and I agree with that! It is fitting that her music genres at a 2017 Year’s Eve popular spot in downtown Raleigh expanded to include R&B and POP. It could be difficult to get to know public figures like Rissi, who began her career on the road like Taylor Swift going from town to town to do radio interviews as part of the Country music scene. Yet she is very open to meeting and connecting with her fans. I was fortunate when she, her husband and daughter visited my first art show in downtown Raleigh. You would think that was the time to take photos but not one, just talking and sharing. It was a fantastic moment. I could sense her openness for people, patience, humility and awareness. Perhaps these personality traits helped drum up her strong opinions on societal wrongs. I’ve spent time while in New York going to jazz clubs around town. At ‘Slugs’ in the east village, I heard all time greats like Pharoah Saunders, McCoy Tyner, Elvin Jones, former members of John Coltrane’s band. I saw Carmen McCray in New York’s West Village, and Miles Davis and Arthur Prysock in Harlem. Midtown dinner clubs hosted Joe Williams, and Johnny Hartman. Great singers included a moment at Howard University in DC singing Christmas carols with the amazing voice of Donny Hathaway. 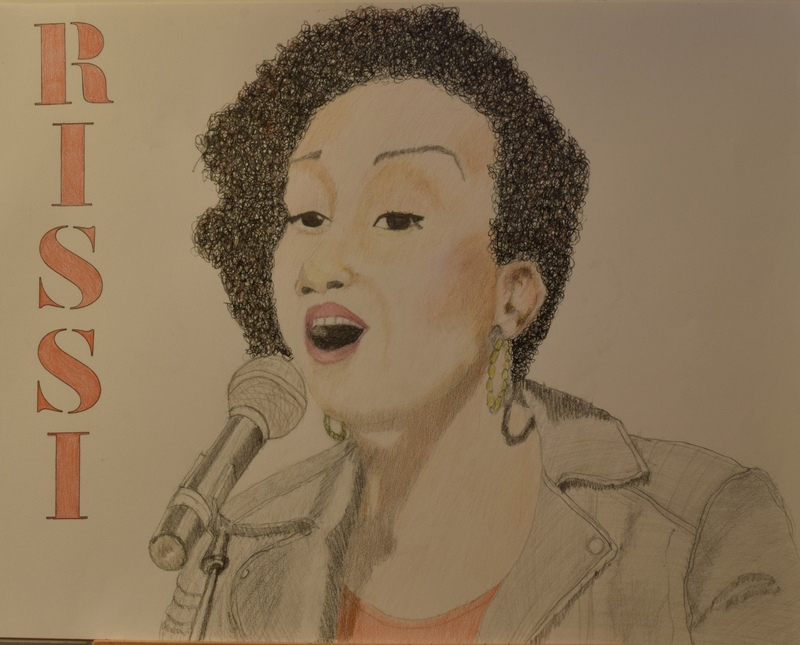 Rissi is a special singer on the rise with a unique message. By musician standards she is still very young in her evolution. Her passion and voice extended to youth under the umbrella of her non-profit, WeAreSeeds.net, ‘focused on “raising happy, healthy, socially conscious, intellectual, and spiritually strong children in the ‘Post-Truth’ Resistance Era”’. This site and initiative is a reflective of her worldview! Rissi Palmer’s new ‘Seed’ Album, inspired by the name of her non-profit, hits the market on October 15, 2018 according to her Instagram post. I also noticed she had been working on a socially conscious video. You may keep up with this unique song bird on Instagram, when lucky sometimes, even live around Raleigh! Art and article by Lillian L. Thompson of Lillianonline. Carlita Victoria a Rising Star! I’m fairly sure I will be informed a lot of new stuff right here! I have responded and your email is undeliverable. Have a great day! I go to see everyday a few sites and websites to read articles, however this web site provides quality based content. In this case I got it from Rissi Palmer. Very nice write-up. I definitely love this website. Stick with it! Hi to every body, it’s my first pay a quick visit of this blog; this webpage consists of remarkable and truly excellent information in favor of visitors. I’m rather sure I will learn lots of new stuff proper right here! someone that genuinely knows what they are discussing on the internet. How kind. Thank you. I have passion for causes, lifestyles, and commitments the people I write about! or some else know such detailed about my trouble. You’re amazing! be shared across the web. Disgrace on the search engines for not positioning this post upper! Hey There. This is an extremely well written article. I’ll make sure to bookmark it and return to read more of your useful info. require a massive amount work? I have no understanding of programming however I had been hoping to start my own blog in the near future. off topic however I simply needed to ask. Thanks a lot! WordPress. Be inspired. Blog through your inhibitions. Make it happen! Hello There. This is a very well written article. How do you find inspiration for your posts…? I am interested in many things…..? web, however I know I am getting know-how everyday by reading thes pleasant posts. The whole glance of your web site is great, let alone the content! your blog. It appears as though some of the written text on your posts are running off the screen. Images running off the page is not what I get comments on often. My internet company does not observe this problem as they check from their location. I am glad to find so many useful information right here within the post. thanks for sharing. . . . . .
You are in reality a excellent webmaster. The website loading velocity is incredible. Furthermore, The contents are masterwork. sites on the internet. I am going to recommend this site! desire to suggest you some fascinating things or suggestions. Interesting to expand the topic in expanded version of this article. I see the potential. Thanks for feedback. I do not even know the way I finished up right here, however I assumed this put up was good. I do not recognize who you are however definitely you are going to a well-known blogger should you aren’t already. Hi, Neat post. Excellent writing. Go Daddy says clean out your cache. They checked with no problems. Thanks for feedback. Much appreciated. Do you mean part 2 article on Rissi Palmer? I am working in with WordPress with my site provider. This may be why my site works the way it does. Yes am using WordPress. No webmaster needed! Yes you may share my blog with your ‘myspace’ group. Appreciate your interest.